Emergence and Why it’s the Best Thing, Kind Of. In 1974, the world was introduced to an experience called Dungeons & Dragons. Borrowing from the noble efforts of its predecessors, D&D featured a game dynamic where the players themselves were responsible for establishing the game’s content. But why leave so much responsibility in the hands of the players? Won’t this diminished level of authorship and control ruin the quality of the experience? Believe it or not, D&D used this model to net over $1 billion in books and equipment sales over the past few decades. But how? A lot of why this works is a little concept called “emergence”, the phenomenon of players becoming real-time content creators for a game by injecting their own stories, goals, characters, and culture into the gameplay. While it requires some creativity of your players, this also empowers them to experience high levels of autonomy and purpose (and subsequently retention). Now, this isn’t something that we can’t already achieve in non-emergent games, but as Sid Meier says in his 2010 GDC keynote, utilizing the existing creativity of your players can save you millions in content development. Emergence seems like a no-brainer for saving on development costs right? Is there any downside? 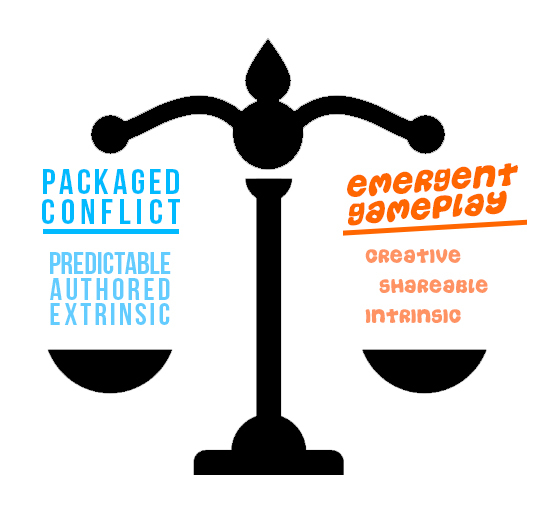 As with all things in games, emergence is dependent on the experience you’re trying to create. Sure, sandbox-genre franchises like Grand Theft Auto and World of WarCraft create fairly open-ended worlds for players to explore, but does that mean that games like The Last of Us are inherently less effective by delivering a more authored experience? Of course not. Emergence is simply a solution for allowing players to feel a particular amount of agency and freedom in a gaming experience. Imagine your audience wasn’t very creative to begin with, or if we lived in a parallel universe where the market was saturated with Minecraft clones (poker face). In these scenarios, the appeal of a game that offers a lot of creative agency might be diminished. Thus we learn that there is a balance to be had with emergent gameplay and the needs of your audience. In other words, well-paced challenge and gameplay can introduce players to expressive problem-solving as well creative problem-creating. To use a specific example, when playing through a Far Cry title, our love for a specific weapon can sidetrack us towards the emergent goal of acquiring all upgrades/equipment for that weapon – completely disregarding the authored intent of the main narrative. But this isn’t a self-perpetuating system. Eventually the lack of external authorship can begin to weigh on a player, and that’s where communities come in. Now I’ve yet to direct emergent gameplay design for a large-scale title, but my interest in utilizing a community to encourage emergence has certainly piqued after working on the emergent systems of Outbreak. 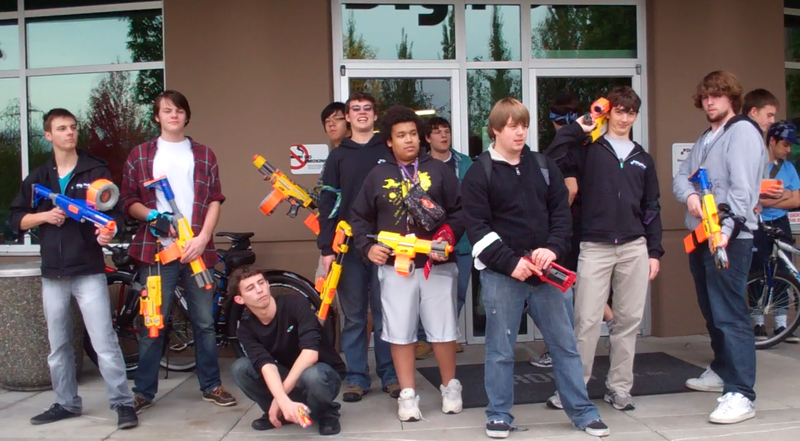 In this live-action zombie apocalypse scenario, hundreds of players attempt to hunt and/or survive during an otherwise-normal workweek. Day after day, players gather to share their heroic (and sometimes not-so-heroic) stories, all of which emerge from the simple scenarios and rules put in place by the game systems. But what if we were to take community emergence further by combining personalized content with developer authorship? Is that even possible? To test how this might work, we ran several experiments. Our first experiment theorized that adopting player culture into the central conflict would increase player connection and participation in corresponding events. To test this hypothesis, we selected a group of the game’s most socially-prevalent players and squads, and made them “prisoners of war” for the opposing team. In theory, the “prisoners” would feel honored to be chosen for such an exclusive role, while the rescuers would have a rare opportunity to be the heroes of the evening. So what happened in practice? HUGE success! Participation skyrocketed as new leaderships formed among the rescuers, and the prisoners felt a rush of anticipation as they prepared to be set loose upon their captors. This method proved to be a great way for players to evolve their roles in the plot of their emergent stories, while still providing enough authorship to ensure success. This was difficult however, since it depended on the existence of a group of [favorably] popular players. Is there any method for incorporating community and culture in a proactive way? Our second experiment tested the hypothesis that giving players agency over something big, in this case picking the official name their entire hundred-person team, would lead to heightened patriotism, such as communally-developed team logos, chosen team colors to wear each night, or increased recruitment and referrals to non-players. We made a large poll for each team to vote on name, with several basic options provided as a fallback. We guessed how many great choices each team would conjur (as well as how many inappropriate choices we’d have to censor). What was the result? There was barely any participation at all. As it turns out, the opportunity for autonomy and expression was only valuable to players if it was within the realm of a select group of friends who were more likely to reach a quick and amicable consensus (as we had seen with naming individual “squads”). The moment a large group of strangers became involved, the burden of democratic decision-making overwhelmed the perceived value of expression. Emergence isn’t always easy money. Its appeal is heavily dependent on the needs and culture of your community, and must be crafted in such a way that each player feels as expressive as they want to be within the rules of the world. We saw the advantages of adopting player culture and community in Outbreak, but we also saw it fail when expression was taken out of the context of close friends. It’s a tough balancing act. But when you are able to properly integrate the cultures of both individual players and communities as a whole, and when every player feels as if the stories they experience are both relatable and unique, you create the kind of self-sustaining dynamo that has keeps your players coming back for more. Suddenly D&D‘s idea of making players responsible for content doesn’t seem so foolish.